Create a unique, contemporary aesthetic in your kitchen with a 100mm x 100mm x 8mm stainless steel tile — its low maintenance finish makes it a perfect option for even the busiest home. The brushed steel grain on this kitchen tile can also be used to create an attractive chequerboard effect: simply rotate alternate tiles 180° and the appearance of a different shade will be created (due to the variance in light reflection). Our 100mm x 100mm stainless steel kitchen tile is manufactured in the UK and has a sturdy core of MRMDF (moisture resistant MDF) which is wrapped in 430 grade brushed stainless steel. 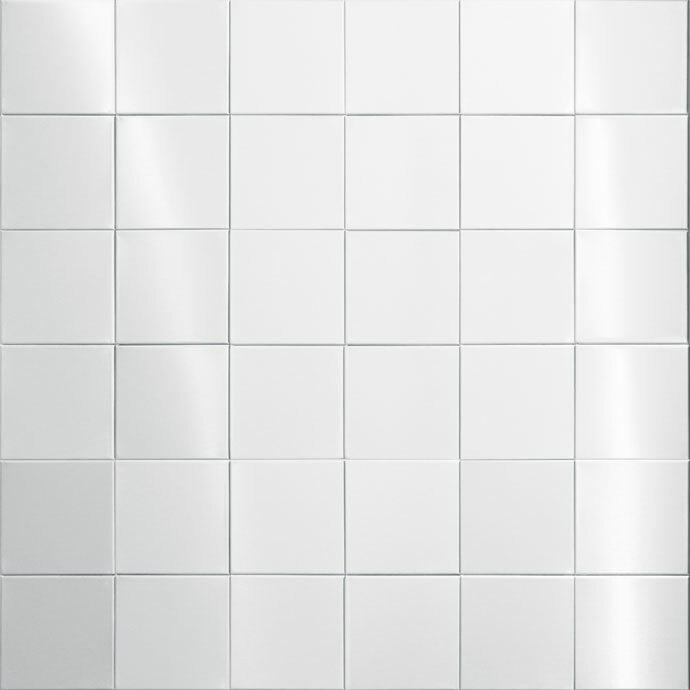 The edges are folded carefully to create the effect of a solid steel tile, and the MRMDF core makes it easier to apply —each item can be fixed in place by using a quality construction adhesive or normal tile grout. This stainless steel tile is easy to clean and will only need an occasional wipe with a soft cloth and some warm soapy water. We hold this 100mm x 100mm stainless steel kitchen tile in stock so we are able to deliver to you as quickly as possible. Once you are ready to order, please select the items you need below and add them to your shopping cart.